County Agent Rob Ferguson sent me this announcement yesterday. Hope to see many of you at the meeting. For more information, please contact Rob Ferguson. 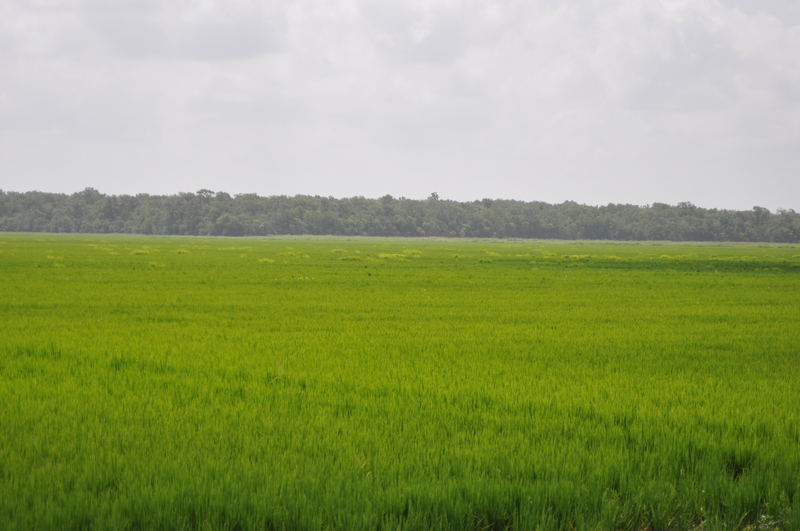 Today I scouted some rice with County Agents Rob Ferguson and Trent in Avoyelles Parish. We visited the Big Horn Farm Partnership which is farmed by two brothers Chris and Randy Dauzat. They have a beautiful operation. I saw a few interesting things that I thought you might like to see. We scouted a field that had a pretty heavy infestation of grasshoppers earlier this season. Rusty Elston reported catching more than 25 grasshoppers per 10 sweeps. This is the damage that was being attributed to the grasshoppers. Let me know if you saw any injury like this that you think was caused by grasshoppers in your rice. Empty hulls that may have been caused by grasshopper feeding on the developing grain. A spray was applied to control the grasshoppers and we could not find any in the field. The application was made about 10 days ago. 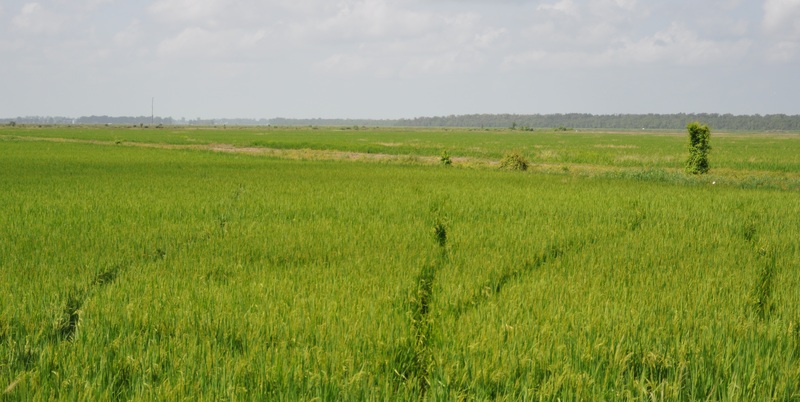 The rice is starting to mature and the panicles are turning down. Some of the grains are still in the milk stage. We did stumble upon a batch of rice stink bug eggs that were just hatching. 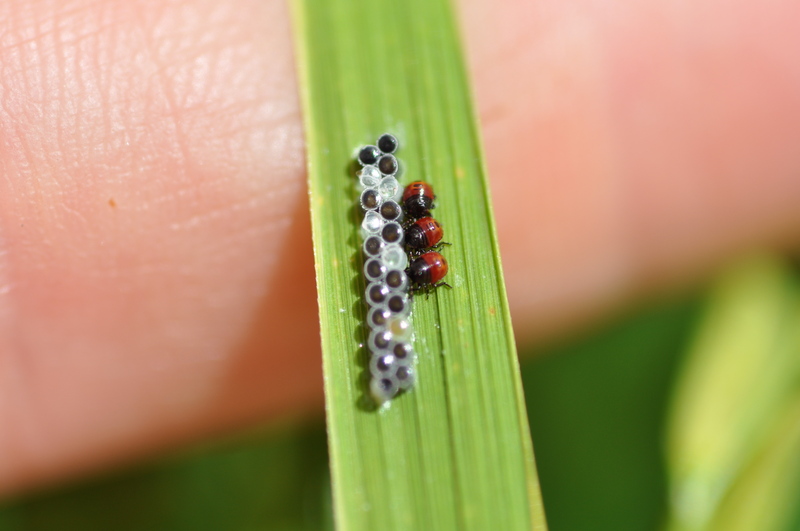 Rice stink bug egg mass just hatching. Notice the egg shells that are like little capsules - these little first instar nymphs are in the process of hatching out through the top hatch. They are about to drain the rice field in preparation for harvest. We also observed an abundance of different birds. This farm has been part of conservation programs for 35 years and you could see the positive environmental impact of these efforts. 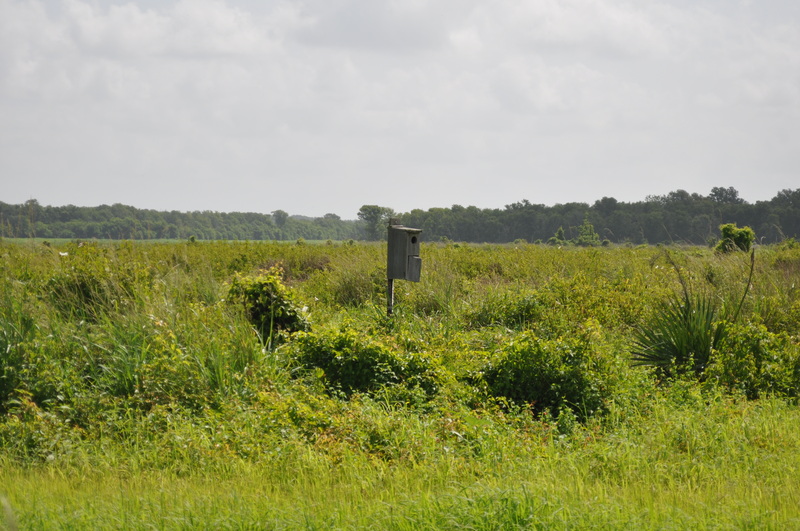 Wood duck box in an area set aside for conservation programs. Large flocks of birds including great white egrets, great blue herons, roseate spoonbills and a number of species of ibis were enjoying the habitat. These conservation areas will serve as an important alternative habitat for birds that typically rely on the coastal marshes. NRCS conservation programs have been implimented this year in response to the potential long-term impact of the oil spill in the gulf. 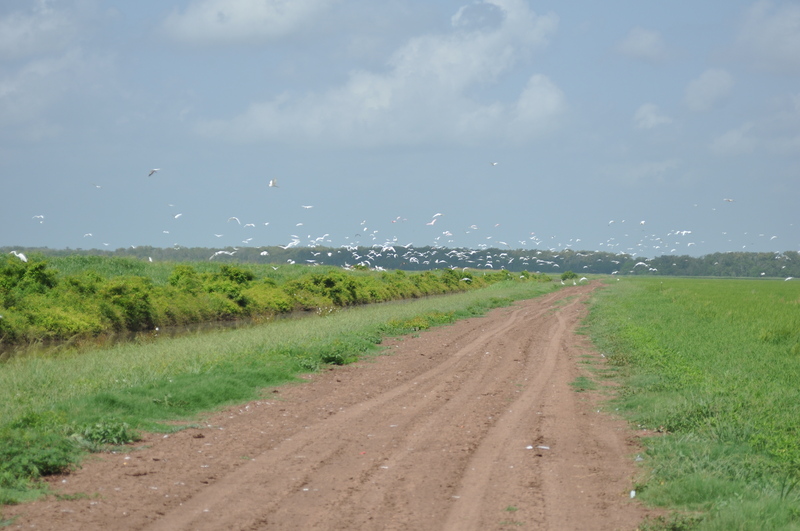 Rice farmers are in a perfect position to provide the habitat desperately needed by a variety of birds and other wildlife. Finally, we saw crews out roguing red rice from water-seeded fields. These are planted in conventional varieties. 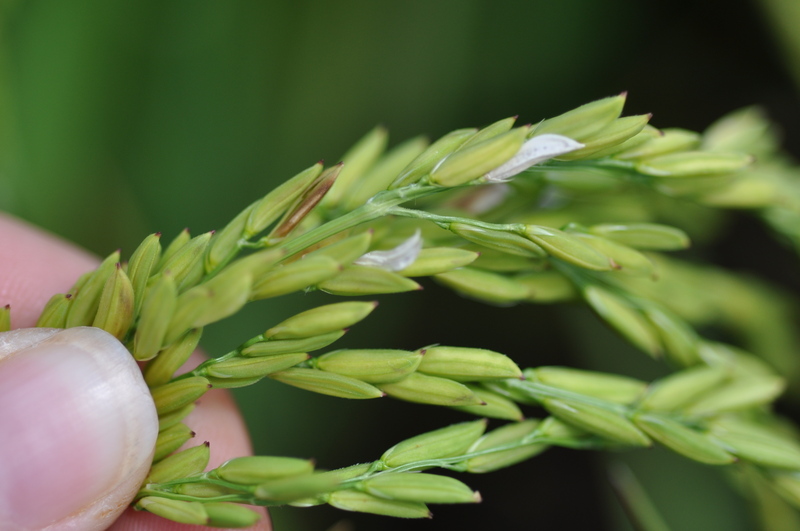 It’s important to remove the red rice before it has a chance to go to seed. The red rice is removed by hand to keep the field clean and prevent adding to the seedbank next season. Clumps of red rice in a field that will be rogued soon. Crew roguing red rice - this is a tough job, but necessary to control this weed! Tracks in the field left by the rogue crew. Sacks of red rice rogued by the crew. 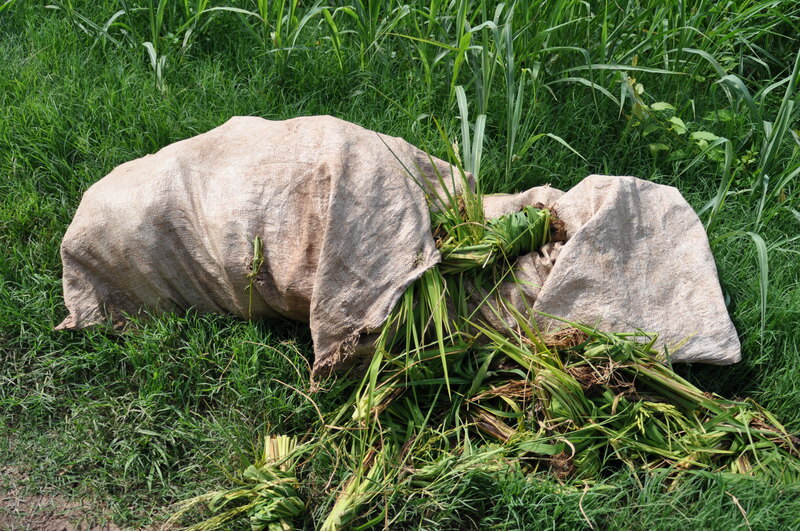 These sacks are collected and the red rice is burned. Hope you have a good weekend. Next week we’ll start harvesting the demonstration test sites, unless we are delayed by Tropical Storm Bonnie.